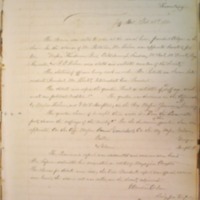 Handwritten meeting minutes from the Jefferson Society at the University of Virginia. The House was called to order at the usual hour, president Adger in the chair. In the absence of Mr. Patterson, Mr. Wilson was appointed Secretary pro. tem. Messrs. Henderson, Reid, Goldsborough, Lindsay, McNeel, McDonald, Page, Reynolds, and RT Wilson were elected and initiated members of the Society. The election of officers being next in order, Mr. Roberts was chosen Intermediate President, Mr. Whitely Intermediate Vice-President.The debate was upon the question, “Would a restriction of the suffrage ameliorate our political condition?” The question was discussed on the Affirmative by Messrs Wilson, and G.McD. Hampton; on the Neg. Messrs. Youmans and Browning.The question chosen of to-night three weeks is: “Does the Democratic party deserve the suffrages of the country?” For the discussion of this question there were appointed, On the Aff. Messrs. Daniel Saunders, Felton, and Gibson On the Neg. Messrs. Godwin, Geigon, Hampton, A.The Treasurer’s report was submitted and excuses were heard. Mr. Lefevre submitted his resignation as editor of Magazine. Accepted. The classes for debate were read; the Vice-President’s report was offered; excuses were heard; the second roll was called; and the Society adjourned. University of Virginia. Jefferson Society, “Jefferson Literary and Debating Society Minute Book,” 1880 February 28, WWP17255, Jefferson Literary and Debating Society Records, Woodrow Wilson Presidential Library & Museum, Staunton, Virginia.